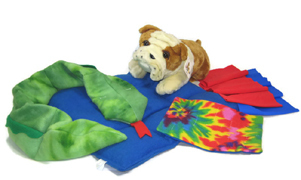 We are excited to offer a variety of therapeutic weighted products, including Weighted Blankets, Lap Pads, and Cuddly Companions Weighted Stuffed Animals! 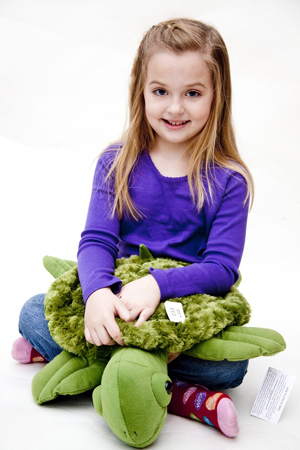 Weighted products are great for play therapy and provide gentle, comforting pressure that helps to calm and focus people with a variety of special needs, including autism, sensory processing disorders, ADHD, and more. Weighted products also work great along with all our pillow furniture pieces for the ultimate in enveloping comfort! Shipping is free for all weighted products within the contiental United States! DISCLAIMER: All products should be used under the direction of your educator, therapist and/or doctor. Adult supervision is necessary, children should not be left unattended with any of these products, which have been modified at your request. Weighted blankets should not be left in bed or on a child in an adult's absence. An assortment of available therapeutic weighted products! 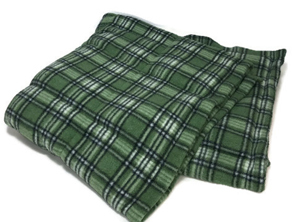 Weighted Blankets come in 3 standard sizes: 5 lb 30"x42" Small, 8 lb 36"x54" Medium, and 11 lb 42"x60" Large, and are available in either a denim blue or green plaid fleece. Our weighted blankets are filled, with non-toxic, washable plastic pellets, which are evenly distributed in a quilted pattern so as to prevent weight shifting. 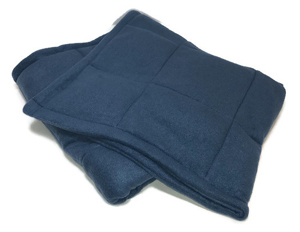 Weighted blankets are washable, and can be heated up in the dryer or cooled in the freezer! Custom sizes and weighted are also available upon request. Organic hemp and cotton weighted blanket and lap pad sets are also available. These products use copper pellets instead, and come as a set which includes a 7 lb 30" x 40" weighted blanket, 3 lb 9" x 11" lap pad, and two .5 lb wrist weights. Blankets can be custom made for your individual needs and the weight you require, please contact us for a quote. The suggested blanket weight is 10% of your weight plus 1lb, but it is best to check with your physician or therapist. 5 lbs 30" x 42"
The 4 Piece Organic Weighted Set In Cotton And Hemp Fabric. 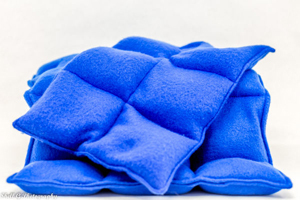 8 lbs 36" x 54"
11 lbs 42" x 60"
Weighted Lap Pads come in 3 standard sizes: 2 lb 9"x13"" Small, 3 lb 13"x13" Medium, and 4 lb 13"x19" Large, and are available in an attractive royal blue fleece fabric. 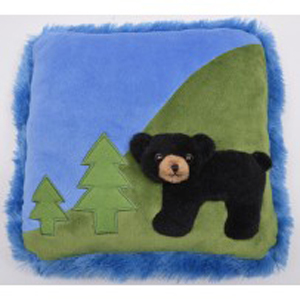 Also available is a unique 3 lb 12"x12" Animal Scene Lap Pad which incoroprates interactive elements for fidget play. 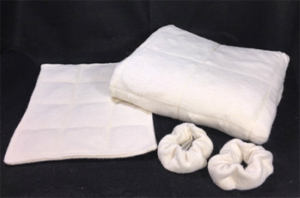 Our lap pads are filled, with non-toxic, washable plastic pellets, which are evenly distributed in a quilted pattern so as to prevent weight shifting. 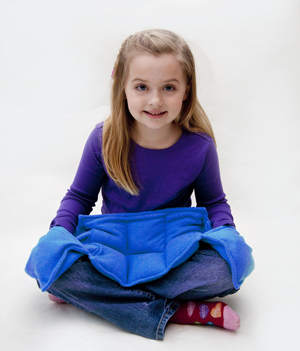 Lap pads are washable, and can be heated up in the dryer or cooled in the freezer! Lap Pads can be custom made for your individual needs and the weight you require, please contact us for a quote. 2 lbs, 9" x 13"
The Animal Lap Pad. Roll Over The Image To See The Other Style! 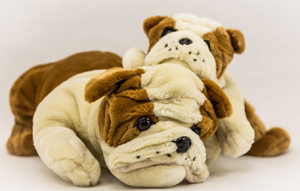 3 lbs, 13" x 13"
4 lbs, 13" x 19"
Our Cuddly Companions Weighted Stuffed Animals are available in a variety of different sizes, weights, and styles. 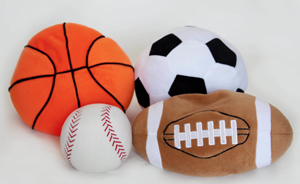 They are great for play therapy as a fun way to incorporate weight building exercises, and also work great as a cuddly alternative for a lap pad. All pieces are filled, with non-toxic, washable plastic pellets. 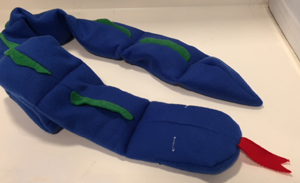 Cuddly Companions can be custom made for the weight you require, please contact us for a quote. Our Weighted Hoodies and Compression Vests are great for getting that comforting feel when out and about. 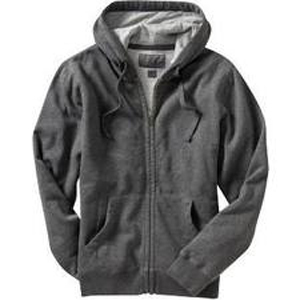 Weighted Hoodies come in a soft, grey poly/cotton blend fabric, are available in adult sizes small, medium, and large, and feature 5 lbs of weighted evenly distributed in the hood and running down the chest for inconspicuous comfort. Neoprene Compression Vests give deep pressure input (similar to the sensation of being hugged) that provides several benefits. From a sensory point of view, they can help to calm/focus a child and give a greater sense of body awareness. 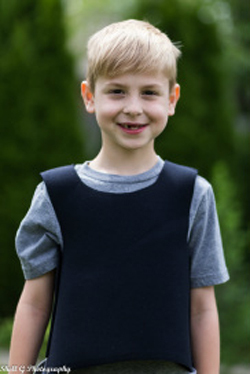 Compression vests are designed to provide constant, even pressure to children and adults with autism, sensory processing disorders, hyperactivity and more. Proper use of this product may result in higher success in the classroom as well. 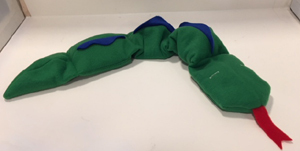 Constructed of 2mm soft loop neoprene side closure adjusts to any body type, they are available in small (size 5/6), medium (size 7/8), large (size 10/12) and extra large (size 14).